I was so excited to receive this cookbook as a gift from Molly. Candle 79 is our favorite restaurant in NYC (also Candle Café West). The photos in the cookbook are beautiful and it helps to have the visual of what we are making. 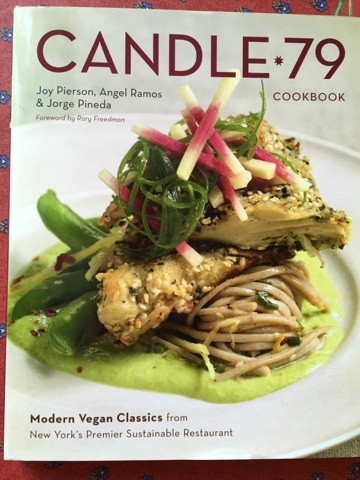 The recipes do not tell you how long they take - most recipes in the book will fall into the "weekend" category. We did try a few of the more basic recipes already. I made a quick batch of hummus using the shortcut of 2 cans of chickpeas, about 1/3 c. tahini and the usual garlic clove, lemon, and olive oil. The variation of this recipe is that it includes cayenne and smoked paprika (which we had on hand). I used more than what the recipe called for- I suggest doing it to taste. It made enough hummus for 2 nights. Delicious and unique! We also made the Blood-Orange Fennel salad. I am not sure if you really need blood oranges. The recipe calls for 6 blood oranges and 2 navel (both segmented). The fennel bulb is what makes the salad. Use a food processor if possible to get the thin fennel slices. Toss with arugula and olive oil and season with salt. It was a very refreshing salad. The more time-consuming recipe we created (and this was a group effort) was the Nori and Sesame-Crusted Seitan. That is on the cover of the cookbook. It had been snowing and sleeting in the morning, so I decided to make my own seitan (gluten, water, tapioca flour, olive oil, soy sauce, and onion and garlic powder) simmered in vegetable broth for an hour. Once you've made your own seitan, you will never go back to store bought. It makes store bought taste like salty cardboard! I will include photos of the process in the future. As the seitan cooled, we used the blender to create a marinade using cilantro, water, white onion sautéed in grapeseed oil, white miso, red pepper flakes, mint leaves, and sesame oil. We all tasted the marinade and it was amazingly flavorful. We marinated the seitan cutlets in a glass lasagna pan for 2 1/2 hours. The book says 3 hours to overnight. I'd recommend overnight. We couldn't really taste the marinade which was a little disappointing knowing how good it was. After squeezing out the marinade, you then coat the cutlets in a mixture of flour, sesame seeds, and broken up nori. It was the first time I purchased nori. It didn't crumble the way we expected - maybe there was another way it was sold. This is a recipe that would go much faster the second time. We served it with a side of soba noodles with some sesame oil, miso, tahini, and scallions with a green salad with avocado. The salad lasted two nights by drizzling some lemon on it. The grape seed oil was expensive, so I would think that safflower oil would work just as well. The seitan cutlets reheated nicely the second night. I will definitely make this again and include my own photos. My daughter Molly and I are not vegans, but we enjoy eating and cooking vegan dishes. We hope we can provide some ideas, support, and inspiration to anyone who is interested in incorporating vegan meals into their diet. If everyone knew how easy and delicious vegan meals are and made even occasional dietary substitutions, we are on the path to a more humane and healthy world. We also hope to show that vegan cooking is something that can be done by the average person. Molly is a full-time graduate student in NYC, and I am a teacher in Massachusetts. Weeknight meals are quick for both of us. Molly is a frugal shopper, so she can offer tips on saving money in an expensive city. We also seek ways to substitute when the ingredients are expensive or hard to find. In other words, shortcuts rule. We have wonderful vegan cookbooks which we will refer to, but we are both known to make changes along the way. We hope you enjoy the two perspectives of vegan eating. Winter brings us inside with candles for hygge and perhaps a nice glass of red wine! Bon appetit!